During my Las Vegas Hiatus, I checked out a few restaurants headlined by some big celebrity chefs. Here’s a look back at my experience at two of those restaurants: Wolfgang Puck’s Bar and Grill and Bobby Flay’s MESA Grill. 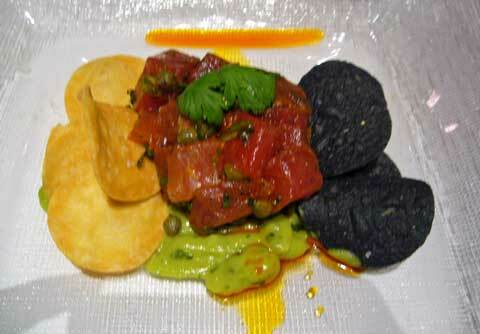 My first night in Las Vegas led me to Wolfgang Puck’s eatery located inside the MGM Grand Hotel. Wolfgang Puck is one of the biggest names in the culinary scene and I’ve always wanted to try one of his restaurants. Hungry and tired from my flight, I was really looking forward to some great food and service. I ordered up a calamari to start (not pictured) which was followed by a calzone and some steamed muscles. The calamari wasn’t great. It was dry and the pieces were totally anorexic. The muscles were probably the best part of the meal, but the cheese sauce was overpoweringly rich, and the muscles weren’t anyting to write home about. In fact, the muscles at home are done better as a whole. The calzone remained mostly untouched. It was pretty dry and the contents were uninspiring. Even tired and hungry, I still couldn’t call this meal a great one. 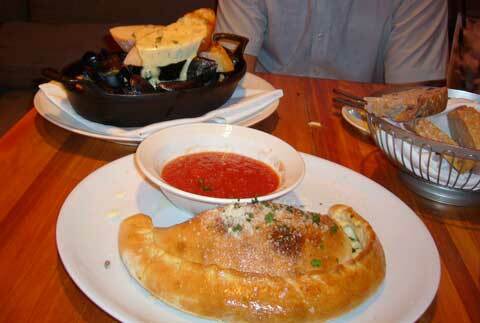 Surprisingly, the calzone that I took back in the doggy bag tasted way better the next day cold for breakfast. I guess having Wolfgang Puck’s name on it doesn’t make it a great restaurant. At a grand total of about $80 US for this meal, it was a very poor value and an utter disappointment. Service was just “doing the job”. On the brightside, the prickly pear mojitos were pretty good. After a dismal celebrity visit with Wolfgang, it was time to see what Bobby’s restaurant had to offer for brunch. The MESA Grill has some of the best breads I’ve ever tasted. 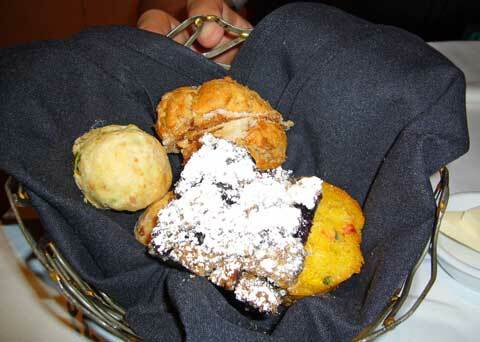 The variety of flavours from the basket were just great. His breads were on par with the ones that the Bread Boy at Lumiere was handing out. From blueberry, to jalapeno pepper, the flavours just kept popping. We started off with the “ROUGH CUT” Raw Tuna Nachos with Mango Hot Sauce and Avocado Crema. This was a great dish that was simple on the outside, but simply exploded with flavour. Its probably one of the best nachos that I’ve ever had. Next, and since I’m a huge Eggs Benedict Afficianado, I ordered up the Spicy Chicken and Sweet Potato Hash with Poached Eggs and Green Chile Hollandaise. This dish was such a surprise. Normally, when you eat an eggs benedict, it has some heaviness to it (a GOOD Heaviness), but Bobby Flay’s Southwest interpretation was light and tickled your tongue with a bit of heat. 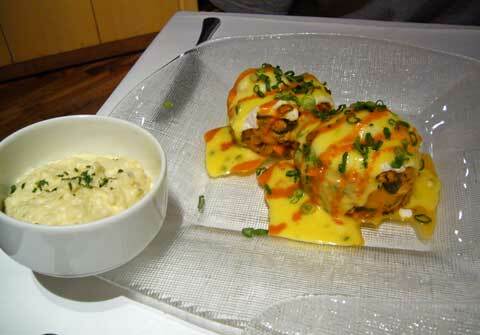 Though I liked this dish, I’m still a full fat benny guy, but I wouldn’t hesitate to order it again. So which celebrity chef won this fight? Well, it looks like Iron Chef Bobby Flay takes this one. 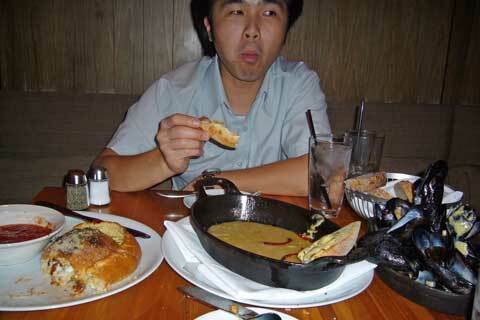 At the MESA Grill, the food was great and priced right and the service was excellent. Our server told stories and made us feel like we were totally welcome. Maybe Wolfgang should come over for brunch one day? Did Windows Update Break Your IE7?